The swapped-in, high-mileage M50 straight-six engine in our racing team’s BMW E30 decided that around 225,000 miles were enough for one of its rods. It ejected said rod onto the track as we got to Hour 19 of the 24-hour Lucky Dog Racing League race, popping a hole in the engine block. That was it. We were done. Somewhere around 7 a.m. on Sunday, I heard “Something just blew up!” over the team radio, off in the distance where I couldn’t see the car from the pits. My teammate Stephanie had pulled off to the side of the track after hearing a big bang. A chunk of engine had punctured the firewall of the car behind the throttle pedal. She pulled the tab to release the onboard fire system as soon as she saw flames peeking out through the hole and climbed out to safety. The worst part is not knowing what happened to the person in your car, and secondly, the car itself. Priority number one for the driver, obviously, was getting out of the car. We knew there was an issue from her brief message from before she hopped out, and the safety truck went out shortly afterwards to retrieve the BMW, but not being able to see what happened from the pits was still torture. A couple folks mentioned a car fire based on what they were hearing from teammates on track, but how on fire was the car, exactly? Soon, the team next to us pulled in for a pit stop. Their driver said they saw a cloud of white smoke out of our car when he was running nearby it as it went. Maybe it was just a clutch that went out? It’s not a 944, therefore, we might be able to handle a clutch swap and keep going until the end. But no—it was a rod. We would have been out of the race from our fire system being discharged anyway, but that also likely limited the amount of damage from the parts that got toasty down there. We could hardly tell there had been any flames at all when the car was back in the pits. What was more obvious than the evidence of a small fire was the giant hole punched in the block by the thrown rod. 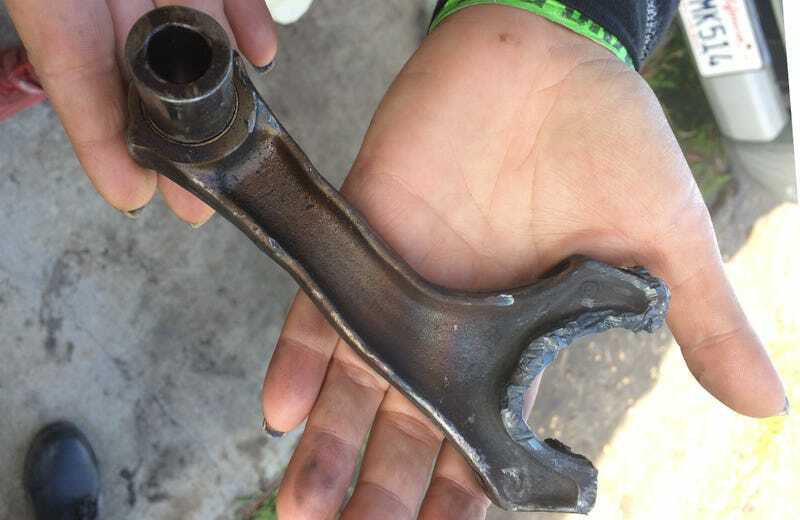 The safety team later had to retrieve the rod from the middle of the track, so we got to ooh and aah at how badly mangled a high-mileage connecting rod can get. Still, we got a good 19 hours of racing out of that car before the engine let go. It didn’t feel like I’d missed out on too much, given the timing—just the rest of the morning as the race continued to noon. Of all the ways a car could go, this seemed like the easiest. It wasn’t anyone’s fault per se—the engine had seen continuous hard use, and it was just time for the rod to go. We’d all gotten a chance to drive, no other teams had collided with us, and we all could use a nap. I feel back asleep in a chair, ate some breakfast and hung around with the other teams who were still running. It was a good weekend, anyway, even if we didn’t finish out the race ourselves. I was still slow, but less so than I expected. Buttonwillow is a blast of a track, and as usual, other beater enduro teams are good people. I still need to do a full 24-hour race, of course—and finish next time.